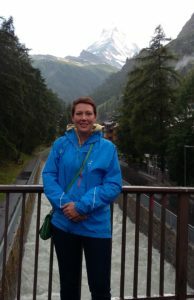 During 2014 and 2015 Claire received treatment for Breast Cancer, including two surgeries, six months of chemotherapy and twenty five days of radiotherapy. 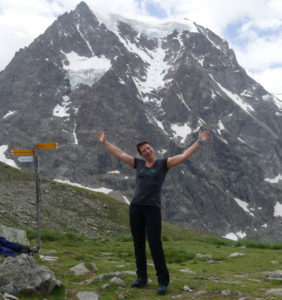 One year after finishing treatment, Claire completed the Haute Route Glacier Trek in the Alps. The route stretches for 75 miles between the two mountaineering centres of Chamonix and Zermatt, and includes a total ascent and descent of over 10,000 metres. The trek requires a guide, and accommodation is in mountain huts. Claire was joined on the trip by a truly international team, with members from Texas and Portland in the US, and Zurich and Chamonix. Claire and fellow walkers took six days to complete the walk, from 17th to 23rd July 2016. Sadly, they had to miss the final hike across the Stockji glacier due to bad weather. 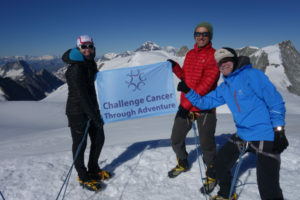 You can read more about Claire’s challenge on her Cancer Adventure Blog and visit her donation page, where she has exceeded her target – well done Claire!